Colusa County Transit consists of nine vehicles and ten full-time employees. We run six buses each day on various routes and also provide out-of-county medical transportation on an on-call basis. When scheduling your ride you will need to call the office, drivers are not allowed to schedule passengers from their bus. All buses are able to hold 19 passengers or 16 passengers with 2 wheel chairs and are ADA compliant. Passengers are not required to register for ADA service. We provide curb-to-curb service to the general population and door-to-door service for ADA passengers. 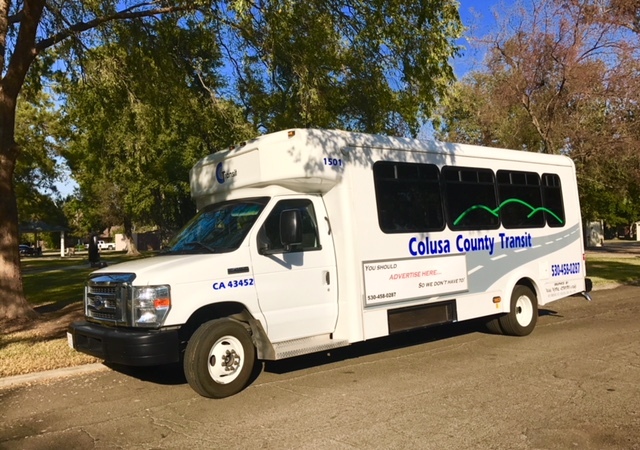 Colusa County Transit Agency (CCTA) operates its programs and services without regard to race, color, and national origin in accordance with Title VI of the Civil Rights Act. Any person who believes she or he has been aggrieved by any unlawful discriminatory practice under Title VI may file a complaint with CCTA. Click here for more information on CCTA’s civil rights program. Please call the office to schedule a ride. Drivers are not allowed to schedule passengers from their buses. Click here to view the bus schedule. For information on the Transit Agency's governing board meetings click here. View the Colusa County Transit Policies.